One hundred years ago, in 1919, Count Camillo Negroni sat at the bar of Caffé Casoni in Florence and ordered an Americano cocktail with a small, but important modification: the substitution of gin for soda water. The bartender, Fosco Scarselli, mixed this new drink for the Count with equal parts Campari, sweet vermouth and gin. They named it the Negroni. Over the years, bartenders around the world have created their own variations of this classic, always with Campari at the heart. 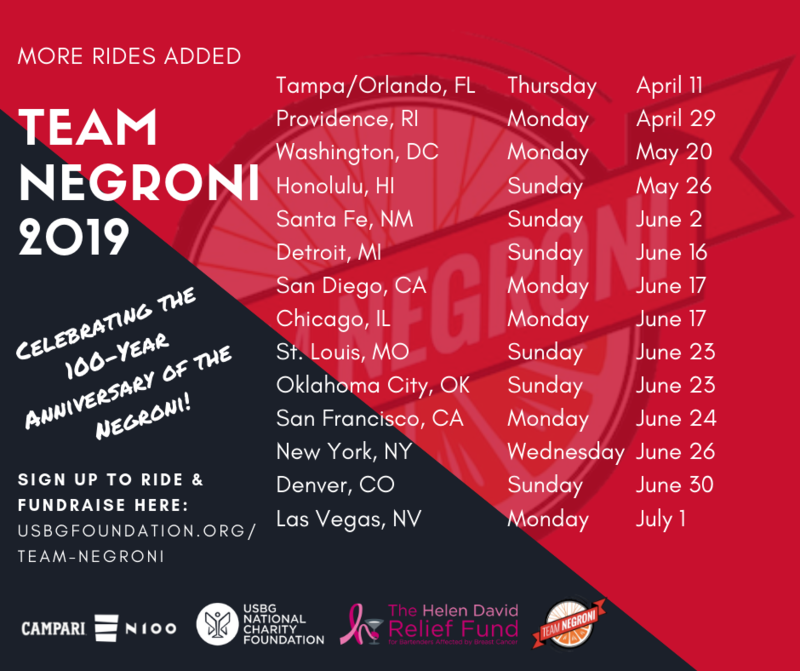 The USBG National Charity Foundation and Campari are excited to announce more Team Negroni rides for 2019! 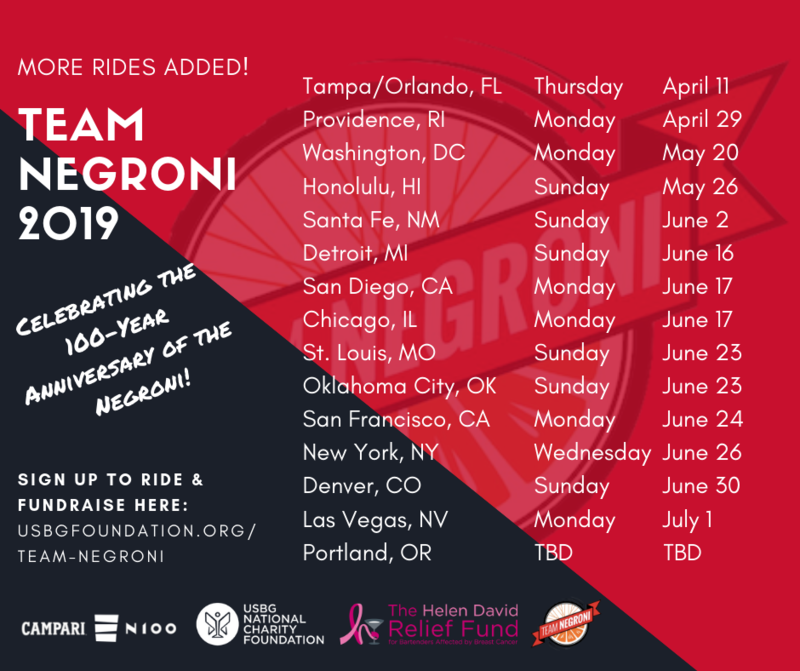 We are celebrating the 100-year anniversary of the Negroni and will be riding from Rhode Island to San Diego to raise money for the Helen David Relief Fund (HDRF), a program of the USBG National Charity Foundation that assists bartenders affected by cancer. 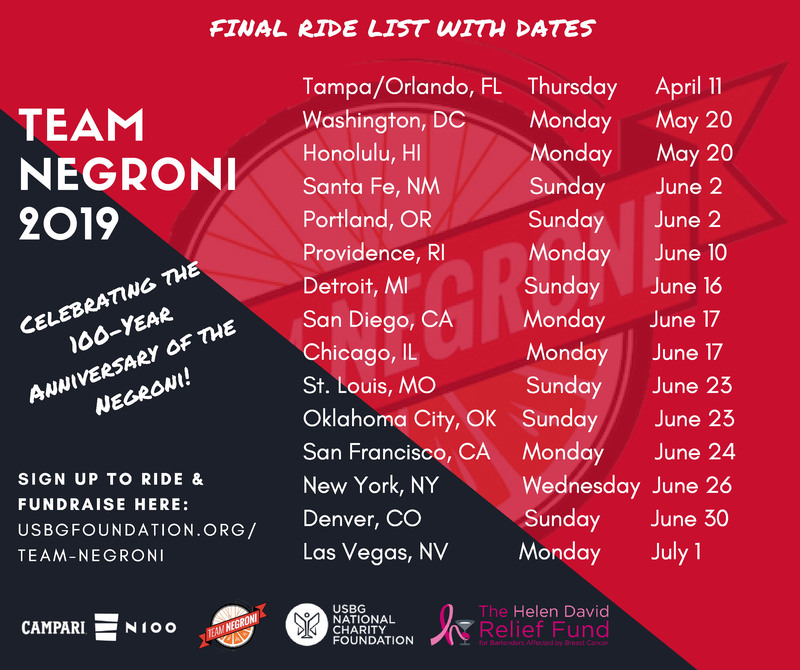 The Team Negroni rides are a great way to get outside, get some exercise, make new friends, and give back to a great cause. Most cities will have two routes, a shorter one for novice riders, and a longer one for those who want to challenge themselves. Everyone who rides will received an N100 T-shirt and a water bottle. Riders raising $250 or more for the HDRF will receive a custom Team Negroni cycling jersey! To register and start fundraising for your team please visit the Team Negroni program page at www.usbgfoundation.org/team-negroni. Team Negroni is open to everyone, not just members of the USBG. So recruit a friend*, clip in, and fundraise! Interested riders can find more information about each ride on the HDRF Facebook page here: www.facebook.com/thehdrf. * All riders must be over 21 in order to participate.